This style of four-plait is made by plaiting four strips into a curve without enclosing the curve as in the four-plait cord. The resulting plait can either be used as a spiral or can be wound up into a koru shape. 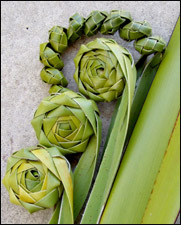 Both are useful for foliage as well as for making flax jewellery. It's best to use a softer flax for this four-plait, especially when making smaller plaits. Make the strips narrower for a smaller plait. Split a flax leaf into four even strips, down as far as the part where the flax joins. The joined part is the stem of the flower. Do the measuring near the top of the flax as this will help to keep the strips of an even width all the way along their length. Cut the joined part to between approximately 20 cm and 50 cm, depending on how long you want the stem to be. Use the blunt edge of a knife to scrape the underside (the dull side) of each strip several times. They will soften and curl a little. Scraping also removes some of the moisture from the strips so they won't shrink as much when they dry. Hold the flax with the shiny side of the leaf facing you and with the joined part of the leaf hanging down towards the ground. Take the strip on the left of the four strips and cross it over the strip to the right of it, keeping the shiny side of the flax up. Then take the strip on the outside right and cross it underneath the one next to it and then over the middle one, keeping the shiny side of the flax up. Keep the strips in their position and make sure they haven't crossed over another strip. Hold the two strips on each side separately in each hand and pull them out to each side at a forty-five degree angle so that the strips are pulled down tight to the bottom. Repeat these steps, making sure the shiny side of the flax is showing all the time. Each time you do these two steps, finish them by pulling each pair of strips out to each side at a forty-five degree angle. As you pull the strips out to each side, push your finger against the flax from the inside so that it pushes the weaving out and the flax curls around. It will start curling straight away from the first plait. As you continue the plait will become a spiral. When the strips have become too narrow to keep the plait the same width, tie the ends by looping one strip around the others, threading it back through the loop and then pulling it tight. Repeat this so that the ends are secured tightly. To make the koru, wind the woven strip around itself from the finished end upwards. Wind the coiled flax inside itself so that the knotted end is right in the middle. Twist this end around more inside the koru to tighten it if needed. Keep winding until the plait is fully wound. To secure the koru and prevent it unwinding a little as it dries, thread an end through the stem of the koru and back through the middle. © Alison Marion Brown 2018.